So, the global economy is growing, but so is uncertainty. Headlines that have appeared in the Financial Times in 2018 include: “Stocks unsettled by global trade uncertainty”, “Counting the costs of Brexit uncertainty”, “Latin America faces up to growing uncertainties”, “Italian bonds under pressure from budget uncertainty”, and “Boeing deal with Embraer faces political uncertainty". A Google news search for “uncertainty” gives about 0.6 million results for the whole of 2017, but 2.5 million results for the first ten months of 2018. Can we measure 'uncertainty' more precisely? Or compare the amount of 'uncertainty' in the US to that in China, the UK, or Ireland? We constructed the World Uncertainty Index (WUI) – a quarterly index of uncertainty – for 143 individual countries from 1996 onwards. 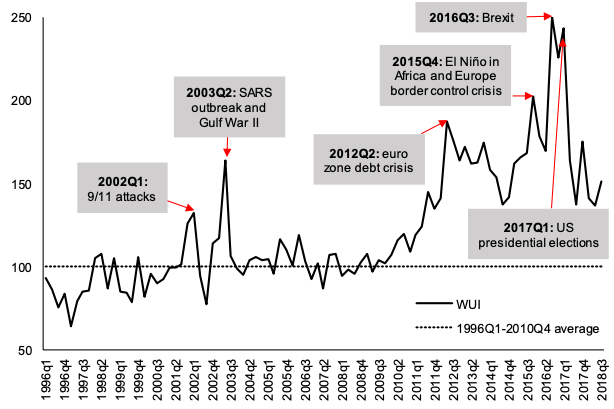 The WUI is defined using the frequency of the word 'uncertainty' (and its variants) in the quarterly EIU country reports. To make the WUI comparable across countries, the raw count is scaled by the total number of words in each report. Source: Ahir et al. (2018). Note: The WUI is computed by counting the frequency of uncertain (or the variant) in EIU country reports. It is then normalised by total number of words and rescaled by multiplying by 1,000. Here is also rescaled by the global average of 1996 Q1 to 2010 Q4 such that 1996 Q1 – 2010 Q4 = 100. A higher number means higher uncertainty, and vice versa. 2. 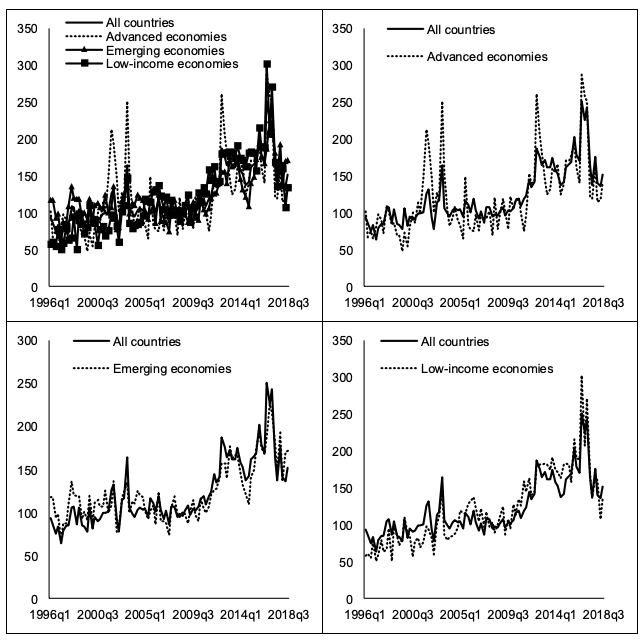 Uncertainty spikes are more synchronised in advanced economies than in emerging and low-income countries. Within advanced economies, uncertainty synchronisation is higher in the euro area countries (Ahir et al. 2018). We find that uncertainty synchronisation is positively related with trade and financial linkages (see Figure 2), even when controlling for business cycle synchronisation, so that more integrated economies tend to be characterised by similar uncertainty spikes. 3. 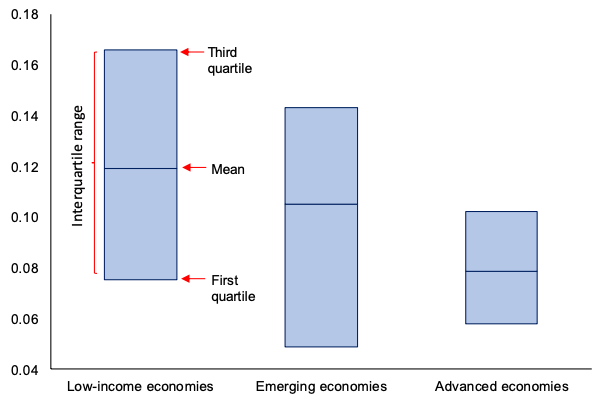 Uncertainty is higher in emerging and low-income economies than in advanced economies. You can see this in Figure 3. There is significant heterogeneity. For example, the WUI for the UK, because of the increase in uncertainty associated by the vote in favour of Brexit, is higher than those of many emerging market and low-income countries. 4. There is an inverted U-shaped relationship between uncertainty and democracy. As countries move from a regime of autocracy and anocracy towards democracy, uncertainty increases (Figure 4). 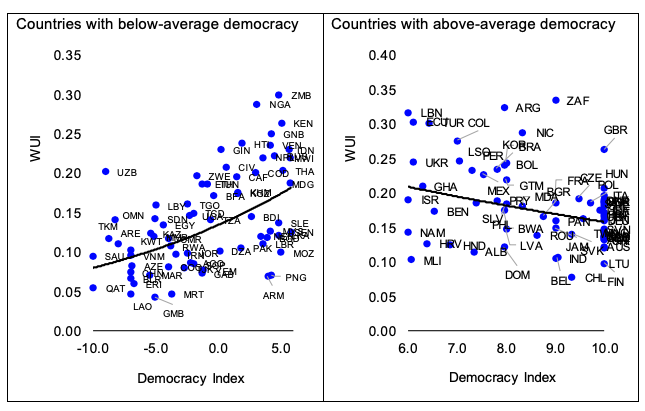 As countries move from some degree of democracy to full democracy, uncertainty declines. Note: The democracy index comes from the Center for Systemic Peace, which classifies the country regimes as 10: full democracy, 6-9: democracy, 1-5: open anocracy, -5-0: open anocracy, and -10 to -6: autocracy. The average democracy index is 5.8. 5. Increases in the WUI foreshadow significant declines in output. This is shown in Figure 5, which runs a standard panel-VAR estimation on GDP growth on shocks to the WUI uncertainty country-level index. Note: VAR fit to quarterly data for a panel of 46 countries from 1996 Q1 to 2013 Q2. 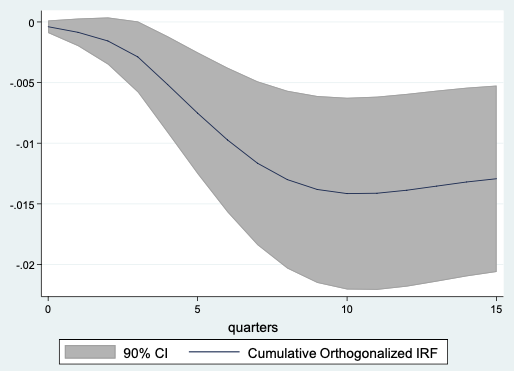 Impulse responses of GDP to a one-standard deviation increase in the WUI – equal to the change in average value in the index from 2014 to 2016 – based on a Cholesky decomposition with the following order: the log of average stock return, the WUI and GDP growth. The specification includes four lags of all variables. Country and time fixed effects are included. We believe that this dataset can be extremely valuable to researches for many applications. First, since innovations in the WUI foreshadow significant declines in output, the WUI could be used as an alternative measure of economic activity when these are not available (such as quarterly GDP for many countries). Second, the dataset can be used to examine the impact of differences in the level of uncertainty across countries on key macroeconomic outcomes. Third, the broad country coverage allows us to tackle important research questions so far not explored because of data limitations, such as the role played by institutions and regulations in affecting uncertainty and shaping the response of economic variables to uncertainty shocks. Ahir, H, N Bloom, and D Furceri (2018), “World Uncertainty Index”, Stanford mimeo. Baker, S R, N Bloom, and S J Davis. (2016), “Measuring Economic Policy Uncertainty”, The Quarterly Journal of Economics 131(4): 1593–1636. International Monetary Fund (2018), World Economic Outlook, October 2018, IMF. Pastor, L and P Veronesi (2017), “Explaining the puzzle of high policy uncertainty and low market volatility”, VoxEU.org,25 May.